Jonna Pelanti has a master of science in technology degree from Helsinki University of Technology and a clinical biochemist degree from Helsinki University faculty of medicine. She began her professional training in Helsinki University central hospital in 2001 when working with her master’s thesis on measurement of nitric oxide in human samples. After graduating from Helsinki University of Technology she went on to work with the detection of forbidden substances in animals in the Finnish food safety authority Evira. In 2007 she started specializing in clinical biochemistry in the hospital district of Helsinki and Uusimaa. 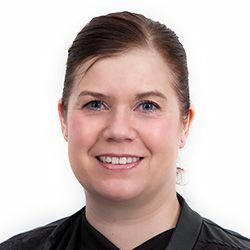 After graduating from Helsinki University faculty of medicine Jonna joined Labquality, a Finnish service company focused on quality assurance of medical laboratories and point of care testingShe started first as an EQA coordinator and is now the head of EQA production and part of Labquality’s management team. Jonna’s main responsibility is to digitalize Labquality’s EQA production and to develop LabScala which is a service portal used by Labquality’s customers and employees. Jonna is interested in external quality assurance in general and as a science. She finds that it is important to work towards correct results in laboratory medicine through co-operation between EQA-providers, customers and relevant groups, institutions and organisations. Developing new kinds of products for end-to-end quality assessment and especially for the preanalytical phase is one of her key interests. She has, thanks to her technology background, an interest and knowledge in digital solutions. She is fascinated with developing external quality assurance and eventually patient safety through professional utilisation of modern solutions. Jonna Pelanti is a board member of the Finnish society of clinical chemistry and a member of the Nordic preanalytical working group.